I am a real list person, I think I always have been. I get great satisfaction of that final crossing of the things I have finished. After having a conversation with my son Shane, I have discovered that is one thing I have passed onto him. We had an in depth conversation on the joy of crossing the completed things of the list. Each weekend I like to write down the jobs I wo uld like to get completed during the following week. But this week there has been only frustration. I made my list last weekend, nothing major just some things I would like to get completed. Then on Monday I pulled my calf muscle and I just couldn't walk around to do anything much. 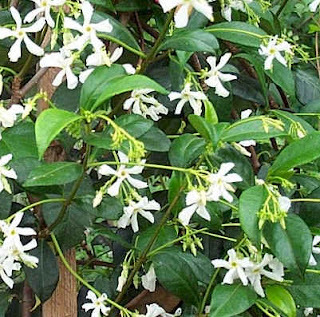 But tonight my calf was feeling a bit better and the weather wasn't 34c, so I headed out into the garden and did some cutting back of my "Star Jasmine", it was really out of control. After having a week of very hot weather some of the plants - new tomatoes in particular really needed some water. But as we are in a drought and on water restrictions I had to do a few watering can loads. Now I am sitting with ice back on my calf, maybe to much to soon. Oh well I am sure I will survive at least I got something done. Have a great day and I hope you heal up quickly! I'm also a great fan of making list! But I get annoyed with myself if I don't always accomplish what I've set myself to do. Sometimes though the amount I'm expecting of myself is too much. Love your gratitude list. . . a pity all of us don't do that from time to time! So sorry about your injury. Hope that will be much better soon, but at least you got out into the garden. We've had grotty weather here, much rain with gales. I love a good list too Davine, and have about ten on the go at any one time... i love to start a new list - at home, at work, And I too love to cross off. I have to confess I even write things on there to cross them off a second later just for the satisfaction ! !